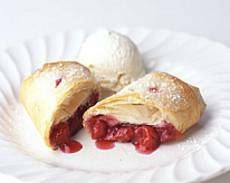 Individual delicious and light cherry strudels to serve to your guests for dessert on the Jewish holiday of Sukkot. If desired, place a scoop of vanilla ice cream on each dessert plate or serve with a dollop of whipped cream and garnish with a mint sprig for decoration. Bring cherries (with any juices), 3/4 cup sugar, and cornstarch to a boil in a 2 1/2- to 3-quart heavy saucepan, stirring occasionally, then simmer 2 minutes. Transfer filling to a bowl and cool completely. While cherry filling cools, arrange 3 phyllo sheets in 1 layer on a work surface and let dry 15 minutes. Keeping 12 remaining sheets stacked, halve crosswise, then stack halves. Cover stack with a piece of plastic wrap and a dampened kitchen towel. Finely crumble 3 dried phyllo sheets into a bowl. Arrange 1 piece of phyllo on work surface with a short side nearest you (keep remaining sheets covered) and brush with some butter. Top with 3 more phyllo pieces, brushing each with butter. Sprinkle 2 tablespoons crumbled phyllo over lower third of buttered phyllo, leaving a 2-inch border along bottom and sides, then top with a rounded 1/3 cup filling. Fold bottom edge of phyllo up over filling and fold in sides to enclose filling completely, then roll up phyllo to form a strudel, about 4 1/2 by 2 1/2 inches. Transfer, seam side down, to a buttered baking sheet. Brush top with some butter, then sprinkle lightly with 1/4 teaspoon sugar. Cut 2 (1-inch) vents diagonally across top of strudel, about 1 1/2 inches apart, with a paring knife. Repeat making 5 more strudels in same manner. Bake strudels in middle of oven until golden brown and crisp, 20 to 25 minutes. Transfer to a rack and cool 30 minutes. Strudels can be baked 2 hours ahead and kept on rack at room temperature. Cherry filling can be made 1 day ahead and chilled, covered.